Diabetes is a fast growing disease in India with more than 62 million individuals are currently affected with this disease. India was ranked top in the year 2000 with more number of persons affected with diabetes, followed by china and united states in the 2nd and 3rd place. Once affected with diabetes, the only solution is to make sugar levels under control with periodic test of sugar levels. In-order to check sugar levels more frequently, you need a glucometer which is more costly. 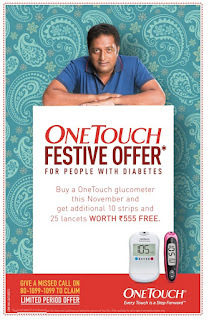 It's a good time to own the Glucometer with the great offer from One Touch. 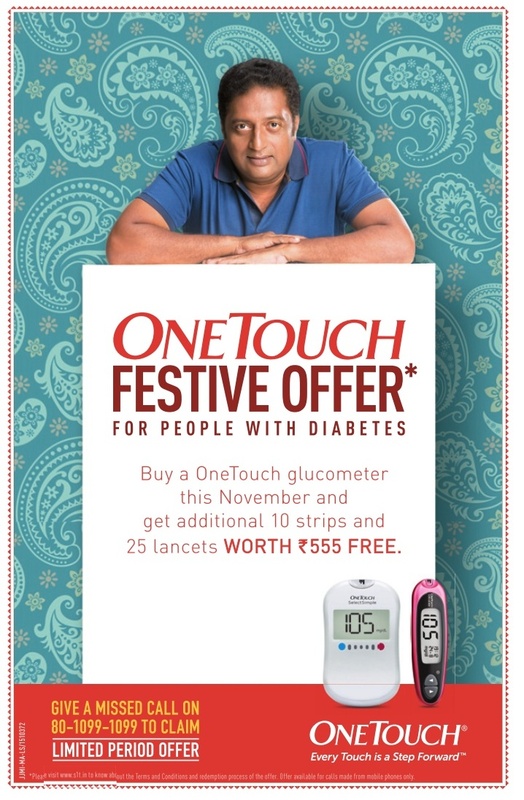 One Touch Festive Offer for people with diabetes. Buy one touch glucometer this November and get additional 10 strips and 25 lancets Worth Rs 555 free. Give a missed call on 80-1099-1099 to claim. Limited period offer. Offer available for calls made from mobile only. For more details visit the site :http://www.s1t.in. Stay fit ! Stay Healthy !